We don’t have a large yard and we have lots of neighborhood cats, so we needed a small, inexpensive sandbox we could discreetly store. We ended up using a Sterlite under bed bin and a bag of sand from Home Depot. It’s smaller than a lot of traditional sandbox arrangements, but it is quite sufficient for home use. I find the size lends itself well to small worlds and play with little toys. 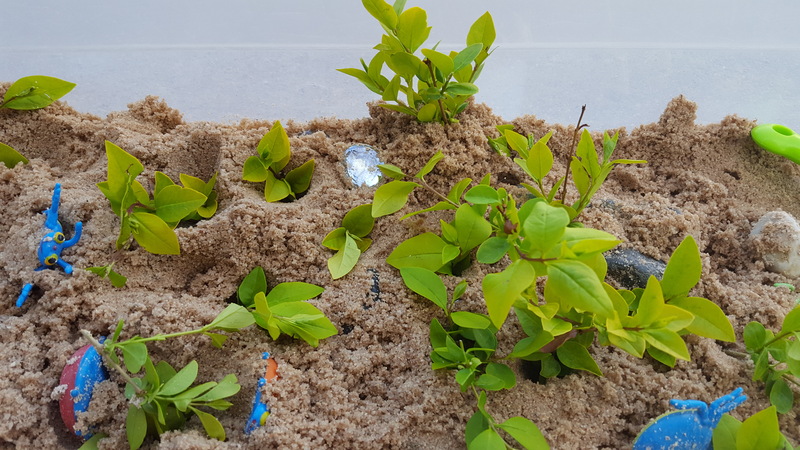 Little ones love pushing sand and things around. We found some tiny CAT style construction toys at the dollar store and they’ve been pretty popular. 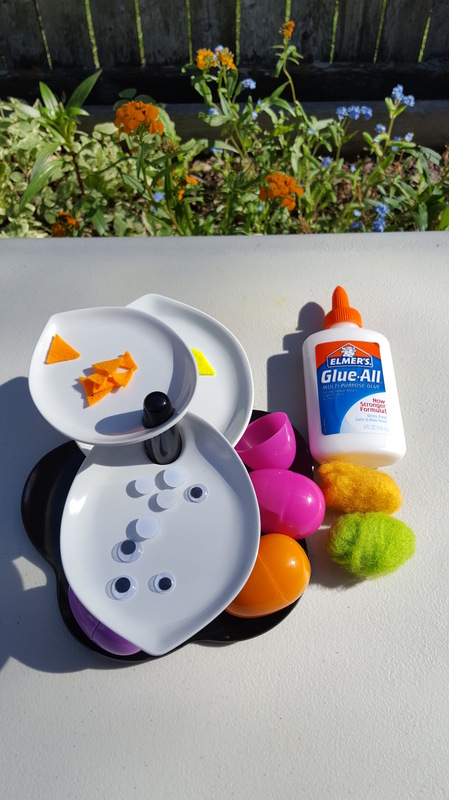 These are great for making little landscapes for the dinosaurs, bugs, or other toys to live in. Kids can stick them in the sand and rearrange them. River rocks can be used to build tiny mountains, designate trails, or make patterns in the sand. We have some blue glass stones that are sometimes used as pretend rivers or ponds. A kid can plant a garden or create a forest with clippings from your bushes. Sand is easier to shape with just the right amount of water. With a spray bottle, your child has enough but can’t get too carried away and make a muddy mess. Smaller toys are handy for the tiny environment. Some of the little molds they make for kinetic sand are especially well suited. Measuring cups, sieves, and funnels offer different ways to manipulate sand. After a few Easter eggs hunts, we had a lot of plastic eggs to deal with. We like to make crafts out of everything from boxes to sticks in our house, so a craft was the obvious choice. 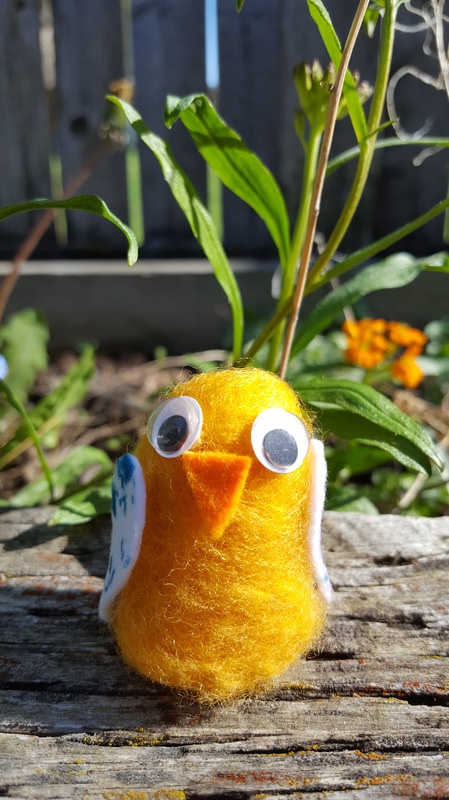 Our little Peanut loves chickens and little birds and cute eggs right now, so I looked through our stash of craft supplies and found something to make birds with- wool roving. You can get wool roving online, at craft stores, or at specialty shops. It is used to spin and do various kinds of felting. This project involves felting. Fill one bowl with plain water. Fill the other with water and a small bit of dish detergent. Fluff out the wool roving by pulling the parallel fibers apart so it’s wispy. Dip you fingers in soapy water and wrap it around itself, forming a little lozenge shape. Add soapy water as needed, rolling the wool gently in your hands until it begins to matt together. You can rise it if it becomes too soapy or dry it with the cloth if it becomes too wet. If lumps or seams form, you can work it out eith your fingertips. If your child is doing this part, you may need to help them with it. When you have your shape, rinse the soap out gently and allow it to dry. It might take a day so it would be good to plan ahead. My little loved this process but he only made one viable bird. I had a stash made because I wasn’t sure how his first foray into felt making would go. Cut out little wings and beaks for the birds. If your child does it, it might be helpful to draw the shapes on the back of the felt for them, depending on their age and skill level. Glue beaks, wings, and eyes to your bird bodies. Allow them to dry. 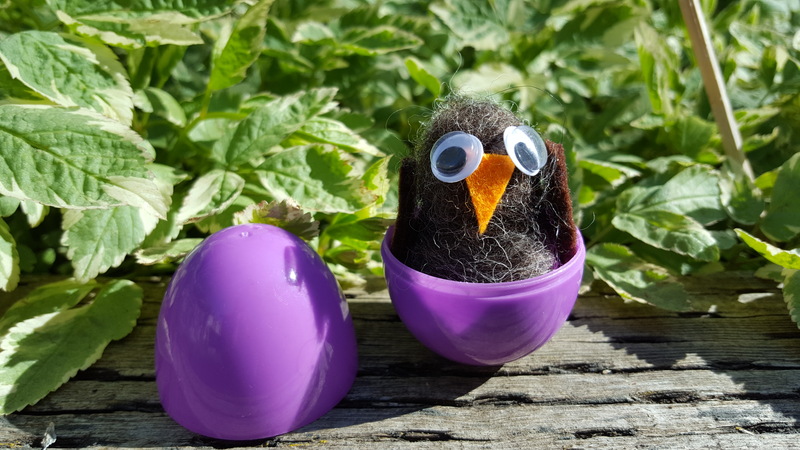 Lastly, this part is for an adult, hot glue the birds to the bottom of the eggs. If they are too tall, trim them from the bottom first. 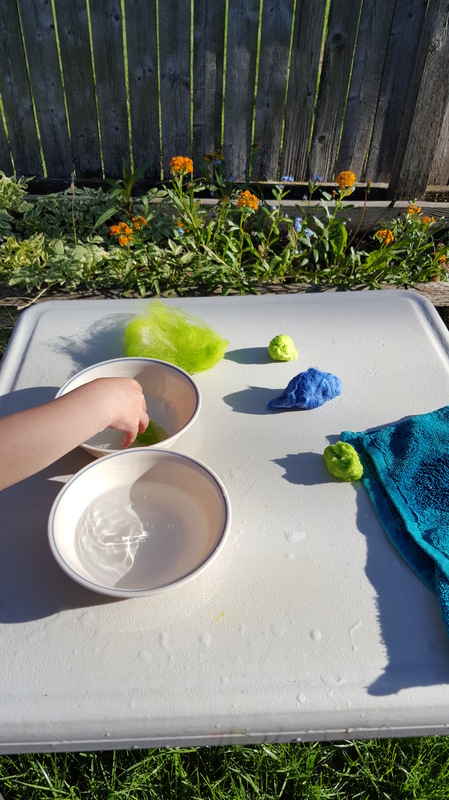 My child really enjoyed this simple introduction to wet felting and picking out colors for his little birds. I love some of the bright color combinations he came up with. Every year, museums around Denver have free admission and special festivities for Día del Niño. This Latin American holiday has been celebrated in Denver since 1954 and has grown in popularity and scale since. This year included celebrations at the Denver Museum of Nature & Science, Denver Art Museum, Clyfford Still Museum, Denver Public Library, History Colorado, and the Byers-Evans House. It’s usually a very busy day at museums, but they are bright and bustling with folk dancers, crafts, and happy children. While we have previously attended the Denver Art Museum’s celebration, this year, we decided to go to the Denver Museum of Nature and Science. In addition to their normal exhibits, they had science talks and demonstrations, a mask making craft, some sweet sheep, alpacas, and goats to meet and pet, an instrument petting zoo, and all sorts of performances. The Denver Public Library sent their bookmobile, well stocked with children’s titles, which was also a treat to check out. Our child was a bit too small for the talks and demonstrations, but they looked like something an older child or adult would definitely enjoy. Hopefully he’ll be willing to sit still a bit next year. 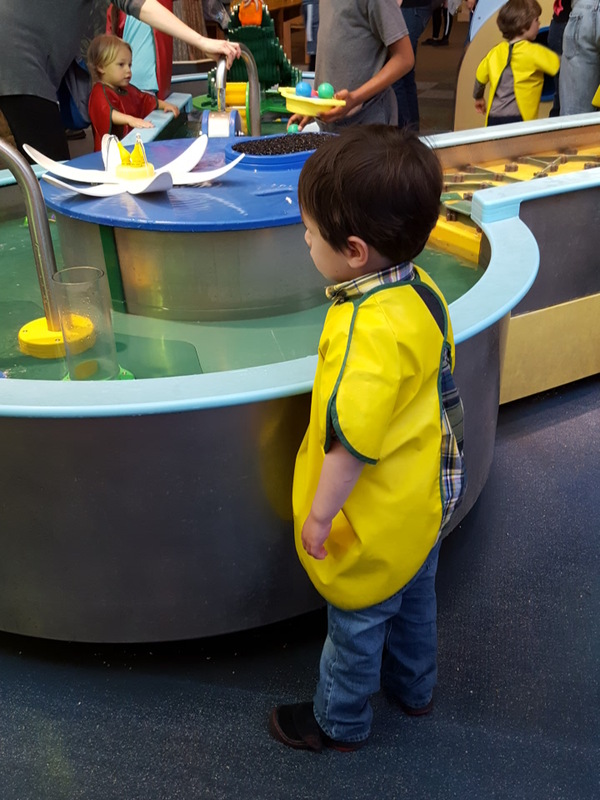 He was interested in the animals, the instrument petting zoo, the gentleman dressed up in the dinosaur skeleton suit, the craft station, and, of course, his favorite museum exhibit, the water play area for children. The best new discovery we made today was probably the performance by a Polynesian dance group. Kalama Polynesian Dancers is based in Aurora and offers classes as well as performances throughout the Denver metro area. Our little Peanut had a giant grin on his face while he watched them, so I will definitely have to find another performance for us to attend. Welcome to my blog. I intend to use this space to share my the adventures I have with my little family. We make art, we cook, we craft, we go on rambles through the woods, we discover new parks, and we explore the cultural offerings around us. I live in the Denver metro area with my family of three. I have a lovely 4-year-old son who likes painting, building, trains, and chickens. He’s constantly building, painting, and exploring. My husband is an immigrant from Singapore, so our household tries to integrate two cultures and sets of traditions. Every day is an adventure.